To measure distance three messages needs to be exchanged. The Tag initializes TWR by sending Poll message to known address of Anchor in time referred to TSP (Time of Sending Poll). The Anchor records time of Poll reception (TRP) and replies with the Response message at time TSR. The Tag upon reception of Response message records time TRR and composes Final message, where its ID, TSP, TRR, TSF information are included. 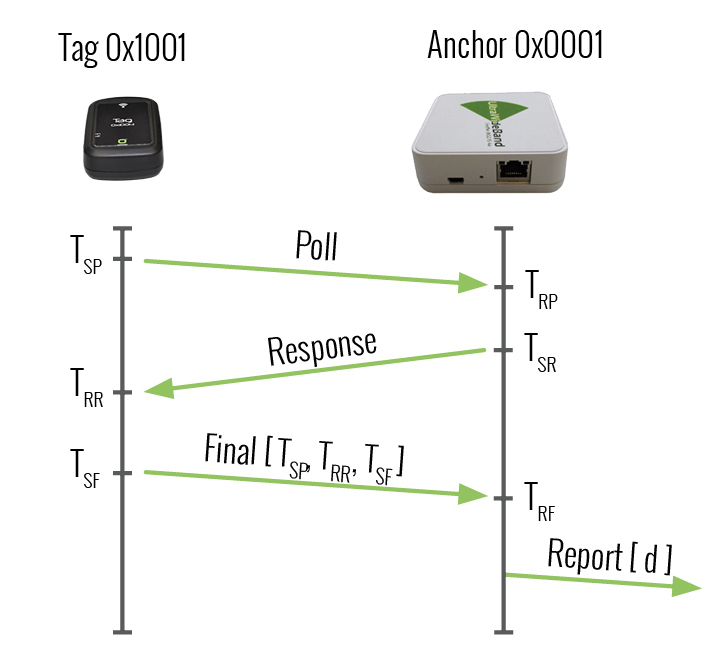 Based on time reception of Final message TRF and information provided in the Final message the Anchor can determine the Time of Flight of UWB signal. Optionally, the resulted distance can be send within the Report message back to Tag or any given UWB device in neighborhood. The experiment show that optimal distance between Tag and Anchor for TWR process is in range of 20-30 meters. How to decode TWR packets? Visit UWB Sniffer page to learn more. The RTLS systems based on TWR scheme benefits from idea that no time synchronization is needed between the UWB devices. On the other way such feature limits scalability of RTLS system since the TWR process is applied gradually with all the Anchors within the system. Furthermore the Tags need to be aware about the address range of the Anchors to gradually poll all the available Anchors. This situation is depicted in figure below. 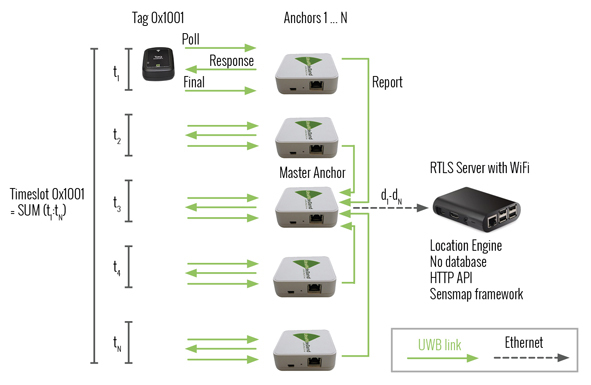 To calculate location of one Tag, it needs to launch TWR process with all the Anchors in system. Therefore length of time slot required to finish all TWR procedures depends accordingly on the number of Anchors in the RTLS system. According to the number of Tags operating in RTLS system, the appropriate number of time slots needs to be reserved within one refresh rate. According to this assumption it is obvious that number of the operating Tags and battery life is limited by required refresh rate and number of the Anchors in the system. Generally the battery life of Tag that reaches several hours or days must be considered when planning application. As described in TWR introduction section, the Report message with estimated distance may be send back through the UWB radio. Such situation leverages possibility to gather all the results wirelessly by dedicated Master Anchor that can directly send information to RTLS server for processing. Such feature brings another limitation in term of scaling of Anchors number, since all the Anchors in the system need to directly communicate with the Master Anchor. The communication distance of Anchors may vary from 20-40 meters according to the indoor environment. The deployment of Master Anchors requires take this limitation into the consideration when planning placement of the Anchors in the facility.